The Wyoming quilt block might look familiar to you because there are several other quilt blocks that use the same patches. The difference is often just the direction of how those patches are placed, and of course the value of the colour of the individual pieces. I have listed some of the similar blocks below for you to compare. 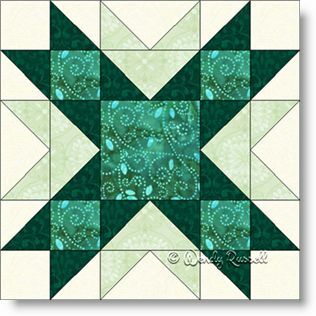 The Wyoming quilt block is a nine patch, which is probably the most commonly used type of block. It contains half square triangles and flying geese patches which are also commonly used in blocks. Choosing a layout for your quilt blocks is a fun chapter in quiltmaking and the illustrations shown will give you some ideas of how to set the blocks in your own quilt.